We’re focused on developing the best user experience for working with data and applications, one that empowers people and increases performance. To achieve this, we develop platforms for integrating, managing, hosting and securing applications. We distinguish above the competition by fully utilising cutting-edge technology coupled with a deep understanding of business goals and the user experience. Our development always aligns technology and the user experience. We work with industries in global e-commerce, online learning, ERP, platform insights and analytics. Our global development team work on global solutions, both in Western and China. We develop bespoke applications as well as integrations and amaglams of technologies to deliver a best in class product. We develop Cloud based infrastructure to scale and achieve rapid development outcomes on our projects. In addition to our bespoke development, we also integrate our own products which utlise Big Data and Machine Learning technology to give superior insights across many different sectors for our clients. We use an agile development methodology, which aids us in creating high quality products with a very rapid development life-cycle. Our 'access' platform enables development in near real-time with our clients, who are able to use our platforms as we develop them. BaseUX are uniquely positioned for speed of development as we utilise a global distributed development model. We have development teams in both hemispheres, giving us continued development night and day. We keep a very open-mind and agnostic approach when defining the User Experience (UX) and the technologies that need to meet the experience. However, when it comes to the Internet facing components we only use and work with Amazon Web Services (AWS) for cloud based hosting infrastructure. The AWS hosting offering is simply the best-in-class for scale, speed and security. BaseUX have an extensive hosting account on AWS, which includes access to Western, Global and Chinese Regions. We host and support what we develop as well as support and deploy to external hosting infrastructures. Fig. 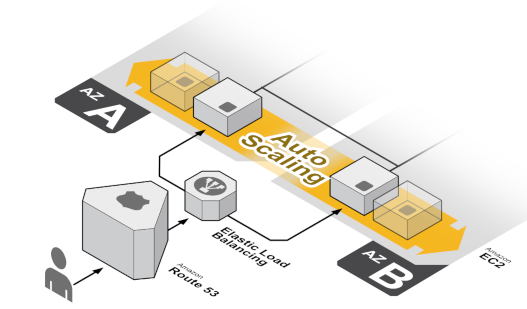 Autoscaling structure on AWS.